Well, I guess parking ticket revenue went to the general fund. But the situation is not as you described it. Though I am noticing the money is now going to the capital fund. The pension system may be part of the operating budget. I'm not sure. Either way, the plan frees up revenue which was previously tied down by state law, and that shouldn't be overlooked. First of all, I don't see the difference between the City collecting the parking revenue directly and being paid for the leasing out of the parking revenue, as it is still parking revenue. 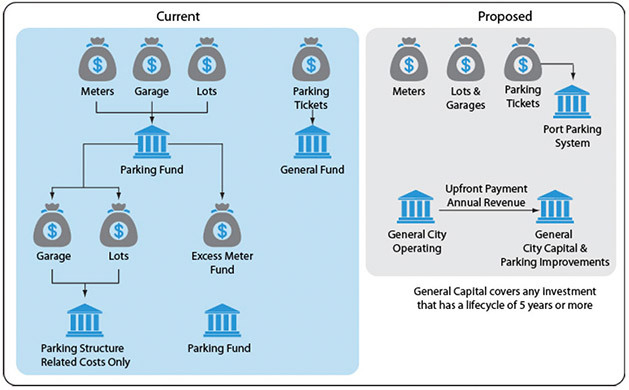 Further, whatever the parking revenue is permitted to be spent on by state law reduces revenue requirements from other sources such as the general fund freeing it up to be applied to the pension fund. Population and salaries are also much higher in Boston. I doubt Cincinnati could withstand such high rates. it's all relative in the end. Doubt a different governor is going to restore the LGF without raising taxes and raising taxes isn't going to sit well with the electorate. Yes, it appears quite myopic which is the crux of my post in opposition to selling the parking revenue asset. There is some merit to this but as you know money is fungible. If the city is getting parking revenue in one bucket that frees up another bucket to be applied to things like the underfunded pension. By the way, does anyone know if the City has plans to terminate access to the pension for new employees and switch to a defined contribution plan? In the very least why not participate in the Ohio PERS and shift the burden to the state level?